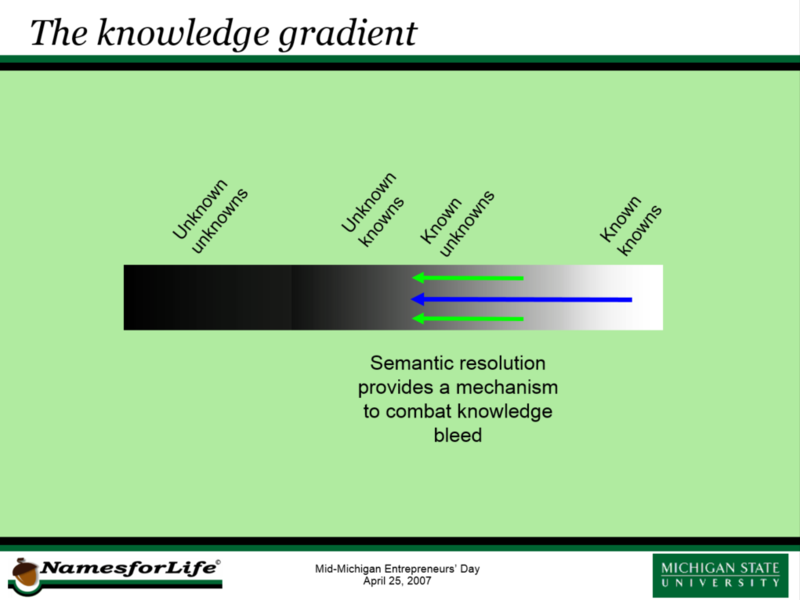 Within the knowledge gradient, there exists another type of unknown - representing knowledge that was once known, but has been forgotten or lost over time. We call this the unknown knowns. This might seem implausible, but it represents a very real risk, not only in biodiversity studies, but in most fields, with the biosciences being the among the most prone to this problem, because of the extraordinary growth in many of the sub disciplines, and the accompanying way of reporting results. Semantic resolution provides a way to combat this knowledge bleed. George Garrity presents the NamesforLife business model at the Mid-Michigan Entrepreneur’s Day. NamesforLife, LLC is initially pursuing commercialization in the Scientific, Technical and Medical (STM) publishing sectors, as well as Biological Resource Centers (BRCs) and diagnostic equipment vendors. In the longer term, we are looking to adapt the NamesforLife model to other terminologies and nomenclatures for economically important eukaryotes, genome annotation and medical/pharmaceutical terminology. [permalink] Posted April 21, 2007.